In 2017, women’s bodies are still seen as a way to sell products. Women’s health and healthcare are still used as political pawns. And women are shamed and blamed for everything bad that happens to them—from sexual assault to breast cancer. It doesn’t have to be this way. You can push back on the forces fueling the breast cancer epidemic right now by sending your email to the CEO and the Executive Chairman of Estée Lauder today! When The Estée Lauder Companies put the first pink ribbon on their cosmetics, they not only launched the breast cancer marketing bonanza, they became the original pinkwasher. Pinkwashing is hypocritical. But exposing women to harmful chemicals in the name of breast cancer is just one of the ways that the breast cancer industry harms women. There is too little to show for 25 years of pink ribbon awareness, publicity stunts, positive platitudes, and billions of dollars spent on pink ribbon products. And it’s clear why. For 25 years, Estée Lauder has been using women’s bodies (and our concern about breast cancer) to sell products. Corporate exploitation of breast cancer through pink ribbon marketing exploits women and our bodies. On the 25th anniversary of the pink ribbon, join us in calling on Estée Lauder to show their commitment to “creating a breast cancer-free world” is more than skin deep. P.S. 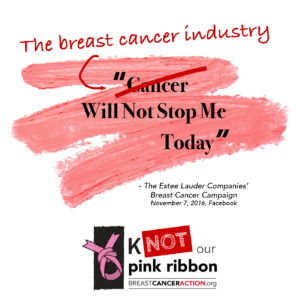 After you tell Estée Lauder to stop the betrayal, share our Knot Our Pink Ribbon campaign on Facebook and Twitter to help spread the word and encourage your friends and family to join you in taking action! ← Thank You For an Amazing Evening!